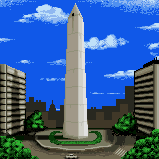 The Obelisk Monument (original name in Spanish: El Obelisco de Buenos Aires) is a landmark in Buenos Aires visited by Luigi during the events of Mario is Missing!. It was built as a reminiscence of the founding of the city. Koopa Troopas stole a stone from the Obelisk, and during Luigi's stay he had to find and return it to the monument. Upon completing his task, he was rewarded 2,375 dollars plus a bonus of 3,800 dollars. The Obelisk Monument, in downtown Buenos Aires, honors the 400th anniversary of the founding of Argentina's capital city. Built in 1910 and made of stone, it was designed to look like the Washington Monument in Washington, D.C. The Obelisk is very tall and can be seen from most of downtown. A small door on the monument's side allows visitors the unique opportunity to climb an obelisk. A staircase inside brings visitors to the top, where they can look out onto the Plaza de Republica and view the entire city. This page was last edited on March 29, 2018, at 18:37.